When I think back on my favorite gifts I’ve ever received or given, it has nothing to do with the dollar amount spent but the thought behind it. I don’t know about you guys, but I’m feeling a little overwhelmed with gift-giving this year and the constant push of sales and more things. Don’t get me wrong… I’m all about a good sale and your girl loves to shop, but when it comes to gifts I really love anything and everything heartfelt. In the world we live in, this time of year can oftentimes be overwhelming. Here are a few of my favorite thoughtful and customized gifts I’ve ever received or given to someone over the years. Many of them can be either purchased or used as inspiration for a DIY. I hope you find this helpful and let me know if you end up using any of these ideas! I would LOVE to see them. 1. CUSTOM ILLUSTRATIONS BY STUDIOIST - Do you know someone who recently purchased their first home? Or moved to a new city? If so, I have the perfect gift idea for you. My sister-in-law Shalan is crazy talented and just recently launched her print shop. I’m so excited I can finally tell you about the amazing gift she gave us for our wedding! I hesitated to share before because I knew you guys would want to order them. :) She gave us the most thoughtful illustration of our home and even included Cooper in our front yard. (This was before Puddles!) Each of her drawings are hand-drawn and hand-painted to order. If you aren’t interested in a custom drawing, she also has lots of Nashville landmarks to choose from on her site. This would also be a great idea for a grandparent’s home or any kind of building that is special to your family. You guys have to check her out - I know you’ll be obsessed! 2. DIY WEDDING ORNAMENT - I also recently shared this ornament that my best friend Cookie made us last year. It was one of the sweetest, most thoughtful gifts I’ve ever received. She took pieces of our wedding invitation and used them for different elements of the ornament. The bow is also made out of a swatch from my wedding dress that she got from my mom. If you know someone who got married this year, this gift is sure to make them smile (or cry) for years to come. There are so many different ways to incorporate different pieces and make a totally one-of-a-kind gift. 3. FRAMED VOWS - I recently shared our framed vows on my Instagram story and was blown away by how many of you asked about it. This is the perfect gift for anyone who has gotten married in the past few years, or maybe even parents or grandparents who have recently celebrated a big anniversary. It would be extra special if you could somehow scan the original vows. We opted not to do that because we both have terrible handwriting. Ha!! I love passing this frame every single morning. It serves as a constant reminder of just how special that day was and the vows we made. 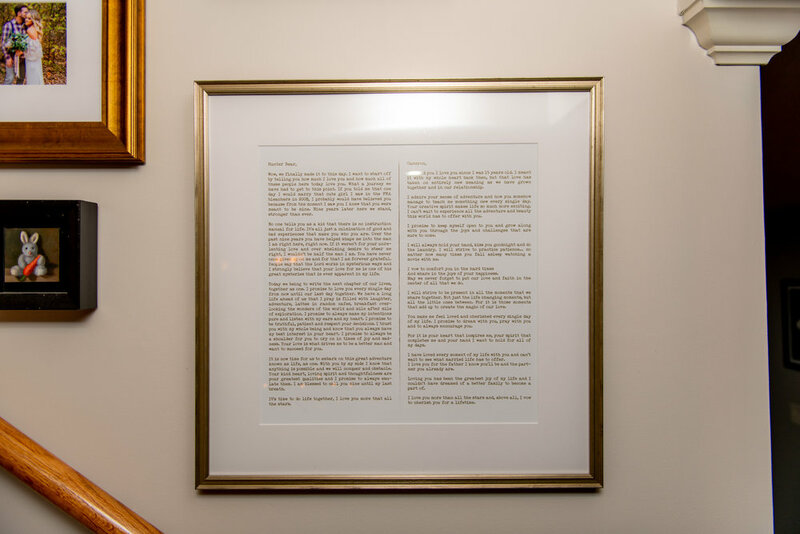 To make a print like ours, simply type your vows in a PDF and upload to Framebridge. They make it so easy and have a great selection of frames to choose from. 4. INITIAL NECKLACE FROM AMERICAN JEWELRY - I wear my name necklace from American Jewelry every single day. It is perfect for that special lady on your list who seems to have everything. I love that it is totally customizable… mine even has diamonds between the letters but you can choose your favorite gemstone or no stones at all. You can also choose important dates like wedding anniversaries, children’s birthdays or any other milestones. My mom got it for me last year and I rarely ever take it off! It’s the perfect dainty everyday piece that tells a story. Use code PREMO15 for 15% off at American Jewelry. 5. WOOD CITY MAP - Our dear friend Michael gave us this gift when we got back from our trip to Florence, Italy where Cameron proposed. It hangs in our entryway and is one of my most treasured items in our home. I love how the wood gives it a rustic and vintage look. This would be a perfect gift for someone who has recently moved, gotten engaged or married or even a teenager who is going off to college next year. 6. CUSTOM PHOTO BLANKETS - If you’re in a time crunch, this one is a great option for anyone on your list! I just made one for our house featuring all of our travels from 2018. I think these photo blankets work best if there is some sort of theme or meaning behind it. This would also be an excellent gift for someone who is recently married or a grandmother with lots of grandchildren. These blankets are super soft and amazing quality. You can use my code ‘HOLIDAY8’ for up to 60% off site wide at Vistaprint until 12/20.